Considering a holiday in Malta? This vibrant and exciting island has a lovely mix of beaches, history and culture that makes for a great varied holiday! Take a look at our top 10 reasons to visit this fascinating island. Malta has a rich, turbulent history of invasions and occupations, and while all is peaceful now its culture and towns have been left with many influences from different countries. The Grand Master's Palace, built in the 1500s, has been the centre of Malta's political activities for over 300 years, but was originally the seat of the Grand Master of the Order of St John who ruled Malta, and was the house of the Governor during the time of British rule. Other historical sights are ancient Mdina, nicknamed the 'Silent City' of Malta, and the ruins of the Mnajdra temple complex. Malta has plenty to keep everyone entertained when the sun goes down! St Julian's is the island's main party resort, and most of the biggest bars and clubs are to be found in the neighbourhood of Paceville, where world-famous DJs play in the nightclubs throughout the year. There are plenty of options for a more laidback night out too - the rest of St Julian's offers stylish bars and open-air venues with house DJs where entry is free and you can sit and chat with friends over cocktails. Malta's best beaches are in the north of the island, where the coast is lined with soft, white sand. 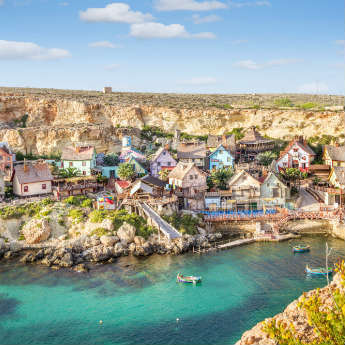 The most beautiful are Mellieha Bay and Golden Bay, Malta's largest sand beaches with plenty of space for sunbathing and a choice of watersports on offer. There are a few more small sandy beaches to be found, but the rest of Malta's beaches tend to be rocky. Don't write them off though - some have smooth boardwalks built across them where you can sit comfortably, and the swimming conditions are fantastic. Comino is Malta's third inhabited island, although barely inhabited - there is only one hotel, just a handful of residents living there permanently, and the entire island is car-free. Most people visit Comino on a day trip from Malta or Gozo, to enjoy the quiet and the dreamy beaches. The main draw of Comino is the Blue Lagoon, a sheltered inlet of clear shallow water on white sand that is a natural swimming pool for guests. 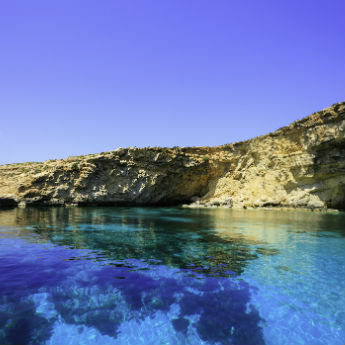 Comino is popular with snorkellers and scuba divers due to the incredible clarity of the water, and has great hiking routes for walkers. 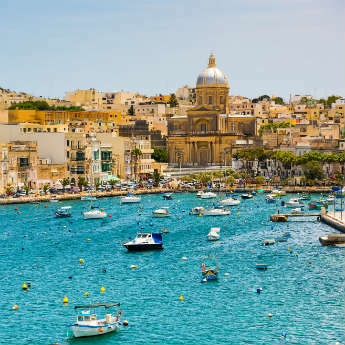 Malta has a diverse Mediterranean cuisine characterised by a range of tantalising dishes. Essential dishes to try include fenkata (rabbit stew), lampuki pie (fish stew) and bragioli (a sautéed beef and olive dish) - Malta specialises in warm comfort food with a homemade feel. A popular snack for lunch on the go is 'hobz biz-zejt', a round of bread dipped in olive oil, rubbed with tomato and filled with tuna, onion, tomatoes, garlic and capers, and if you have a sweet tooth you won't want to miss tasting kannoli, a Maltese twist on the Italian classic of crispy fried pastry filled with ricotta. Malta has a packed calendar of festivals that means whatever time you visit there's likely to be a celebration going on! Music festivals are particularly common - Malta has annual Opera, Choir and Jazz Festivals, as well as the Malta Arts Festival and Valletta Baroque Festival. One of the biggest festivals of the year is Carnival, which happens in February and involves huge parades with music, dancing, floats and colourful costumes. Malta hosts some of the cleanest and warmest waters in the Mediterranean, which makes it the perfect place for watersports! Visitors can choose from a range of activities including paragliding, windsurfing, wakeboarding and water skiing, and equipment can be rented from most of the main beaches. Sailing regattas are hosted in Malta between April and November, and Gozo in particular is a world-renowned scuba diving spot. If you want a few day trips during your holiday, renting a car is a great idea. While it is possible to get around on buses during summer when routes are more frequent, it can still be a long process getting between towns, especially if you're based in a smaller resort. Luckily Malta is easy to get around by car, and the small population of the islands means the roads will never feel too busy. Malta is an ideal place for day trips - the island is small so you will find that you never have to drive far to reach a place of interest. The interiors of Malta's islands have some spectacular natural scenery, particularly on Gozo which is the more rural of Malta's two largest islands. The easiest ways to explore the countryside is on foot or bike, but if you want to challenge yourself with some more ambitious activities you can also go rock climbing, abseiling or horse riding. Malta has a lovely year-round climate, so any time of year is a great time to get outside and explore this beautiful island! The Azure Window is one of Malta's most famous sights, a huge limestone arch near Dwerja Bay on the west coast of Gozo. its an incredibly popular spot that can be seen from the shore but is also popular for boat trips - access by boat is mandatory as the arch is considered too fragile to walk on safely. It's popular with scuba divers, as below it lies the collapsed limestone cave known as the Blue Hole. The cave is reached via a 262-foot tunnel, and divers can see sea horses, octopi and fire worms.